Biamp Systems announced this week the acquisition of Dev-Audio, a developer of advanced microphone processing technologies, as well as the Microcone. 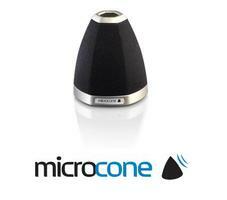 Microcone and its associated software application, Microcone Recorder, are conferencing products that actively track and enhance voice quality, adaptively reduce background noise and record directly to any computer. Using a high-quality beamformed microphone array designed specifically for group settings, Microcone actively locates voices and simultaneously reduces background noise, resulting in what Dev-Audio says is exceptionally clear audio for a wide variety of applications. Iain McCowan, founder and managing director of Dev-Audio, has extensive experience in microphone array technology and will join Biamp as a DSP engineer.